Arijit Oss Sensei, welcome to WMA and its readers! What actually first motivated you into starting karate? AT This would have been back in 1972-73. At the time I was doing lots of other sports at school, athletics, gymnastics, cricket, football you name it. I was doing it and I was doing very well at all of them, but I got bored very quickly. Then the kung fu boom hit Britain. Every picture house had a Kung Fu movie on. I used to think these movies were great, after watching quite a few of them and especially the Bruce Lee ones that came out I was hooked. Clubs opened up everywhere and I suppose it was just by chance that I ended up with a guy who did Shotokan. He was just a Kyu grade who had trained with Asano Sensei and Kanazawa Sensei. We started in a little Scout hut and then he must have thought I had talent, because he took me to an instructor called Brian Collins. Brian was a Dan grade and had been a student of Asano Sensei, he was very strong and he really did start to teach me. I learnt a great deal from him! I couldn’t train at Asano Sensei’s dojo because I wasn’t old enough. You had to be eighteen at the time to train - quite a lot different from today. Eventually I was accepted to train at Asano Sensei’s by Albert Hampson who was the Association secretary. I was still too young but big for my age and eventually was starting to hold my own with the seniors. I had been training some time before joining Asano Sensei’s dojo. I did nearly two years before taking a kyu grading. 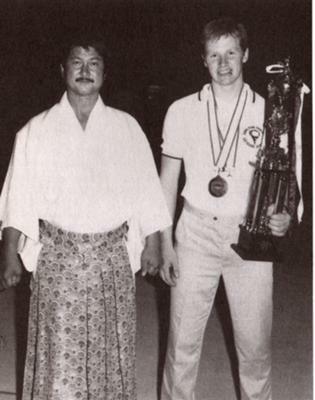 Once I joined the SKI (Shotokan Karate International) I trained with Asano every week. Arijit Asano Sensei was a huge influence on your karate, how do you feel you’ve evolved since you have parted from him? AT Well I’ve certainly evolved! How that relates to leaving Asano Sensei, I don’t really know. I have always looked outside for influences, even when I was with the SKI. I have always trained with other people. I have been told by people that it was not liked, within the SKI that I did this, I’m not sure if it was or not! Remember, I was with the SKI for 12 years, but I have had my own Association now for 20 years so of course I have changed in that time – and so has my karate. Arijit Sensei, which aspect of your karate takes dominance, the teaching or the training? AT They are of equal importance! And I enjoy both however on a practical level my teaching schedule is of importance because it pays my mortgage. My training schedule is important because if I don’t develop on a personal level it will show in my teaching. Arijit What are the points you stress most in your personal training? AT Variation, keeps it interesting, that’s why I personally like training at a gym as well as The Dojo because I like different types of training, but one thing I always do is basics. I actually enjoy basic karate technique even after this many years. I try to put that variation into my teaching, keep it interesting so people don’t realise how hard they are training! The great thing about karate is its adaptability regardless of age, gender, ability, mental or physical disability. Your Karate should change with you. I spoke recently with someone who was asking about sport karate, or rather the emphasis on sport karate and I was saying that a number of people that were on the All Styles British Squad with me in the late seventies, early eighties, some top fighters you don’t hear of or see anymore. Arijit It is 27 years since you won the SKI World Championships, what is the greatest landmark since then that you think you have achieved? AT It doesn’t seem that many years since that I must say, so much has happened in that time, writing the books, producing the videos/DVDs, producing so many champions of my own. Forming the FSK and seeing it develop and become so successful and of course most recently opening my Honbu Dojo in Nottingham. Arijit Who were the major influences in your karate, and who inspires you? AT I have been influenced by many people over the years. from my first instructor as mentioned earlier to Asano Sensei, Ticky Donovan and Dave Hazard as well as the many other Japanese and European Instructors. When you reach the stage that I have about 35 years training now I tend to be inspired by people outside of the martial arts and not just sport. WMA: Sensei, you have had tremendous success as a competition fighter, and now you have a well established teaching profile, but you have also used karate in a very practical way, in the street as it were and that experience comes across in your teaching. AT Well it would be pretty strange if you tried to teach someone to swim when you’ve never been in the water. Arijit You have also had quite a career as an actor how did that come about? AT: I started in the mid-eighties, when I was asked to play an SS officer in a production that was filmed around Nottingham that starred Diane Cannon. I think it was called “Jane’s War” they wanted somebody with fair hair who looked Germanic. This guy at a centre I was teaching asked me if I would do it. At the time it was very difficult to get roles if you didn’t have an EQUITY card. They thought I was great for the role, but I didn’t have a card, so it was no-go. I quite liked idea of the acting, so eventually I got a card. The next opportunity was to choreograph a fight for the British Film School, between two women. One of the women was Pamela Salem who had played Miss Moneypenny in the Sean Connery come-back Bond movie, the other woman was a German actress. This was a real education, because so many unknown problems suddenly come into the open. Stupid things like you can’t do that type of grab because this outfit has got large shoulder pads, or this woman had a wig so that hair grab is out. This really interested me, and I thought yes this is for me! I did a lot of walk-on parts – you know, the heavy standing in the background, or I was a sportsman of one kind or another. I didn’t do any karate until I did that instantly forgettable movie, “I bought a vampire motorcycle” it’s now a cult movie, that’s what they call films that don’t make any money! I did a small Karate role, then I was despatched by the vampire motorcycle! I met some interesting people on that film, Burt Kwok (Kato) Neil Morrissey and the guy who played C3PO in the star wars films. I realised that I didn’t want to just carry on doing these background roles, so I made a firm decision to learn to act properly. I started to train with a lady called Claire Davidson who is a director and acting coach, who worked with RADA and had taught at the British Academy. She worked with Brian Cox the Shakespearian actor, Liam Neeson and Pierce Brosnan. She is very good. I used to travel down to London once a week to her. Arijit What are your hopes for the future in karate, for you and your association? AT I would like the association to grow in numbers yet keep a good attitude, practicing ‘traditional karate’ with instructors that are approachable, so we may maintain the friendly enjoyable atmosphere we have. I think we are achieving this. For me personally, I just simply want to be able to keep putting my gi on and improving myself and karate I find the more I learn, the more I realise how little I know! Why did I go to Japan in 1991, it wasn’t for the training when I got there. It was for the training before! In India Sensei Purandar Sarkar, 5th Dan was my representative, he is Chief Instructor of AISKA and is carrying on with his hard work in a commendable manner. Indian karate-ka have a lot of potential, just be serious and sensible in your training. Arijit If I was to ask you to sum up in one line what should be the most important attribute to training, could you? AT I would say you have got to just keep on doing it! I have seen on the back of tracksuits the slogan ‘JUST DO IT!’ and that’s perfect! People always find excuses. If you just keep on putting your gi on, things will happen! Be honest to yourself, and don’t change your karate to suit others, if you believe what you’re doing is right, then just do it! I think that was five lines…Ha! Ha! Arijit Thanks a lot Sensei. AT Thanks Arijit, thanks WMA and I invite you to my Nottingham Honbu dojo in England. About The Interviewer Sensei Arijit Chakraborty, 4th Dan Black Belt is WSKF India Senior Instructor with more than 30 years training in JKA-style Shotokan Karate. He is WMA National Special Correspondent. Amazing fighter, the best ive seen, and i have watched all the JKA all japan champions in action. Not a bad article but what is the headline about...?